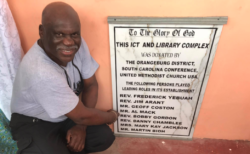 In early 2015 I was approached by my brother-in-law, Jim Arant, to work with the churches of the Orangeburg District of the United Methodist Church to build a school library and technology center in the small village of Abesewa in Ghana, Africa. Not knowing what I was getting into, I said, “sure! 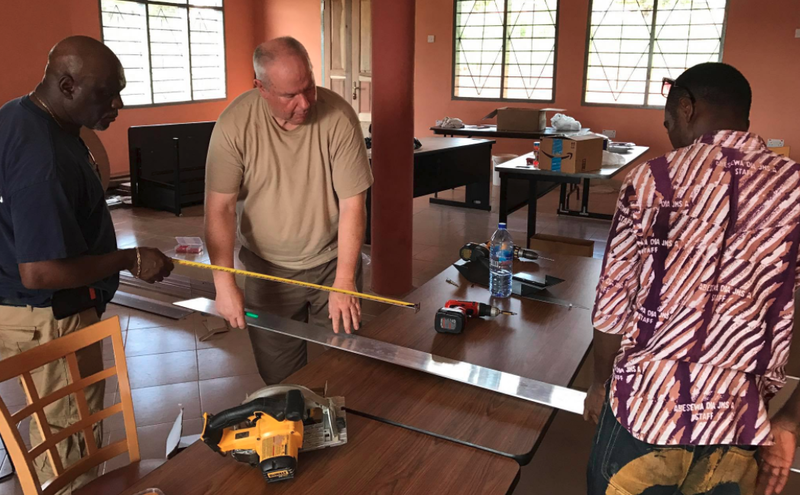 I’ll be happy to help!” We held several meetings throughout the year and Coordinated with the Methodist Church of Ghana to begin construction in mid-2015. 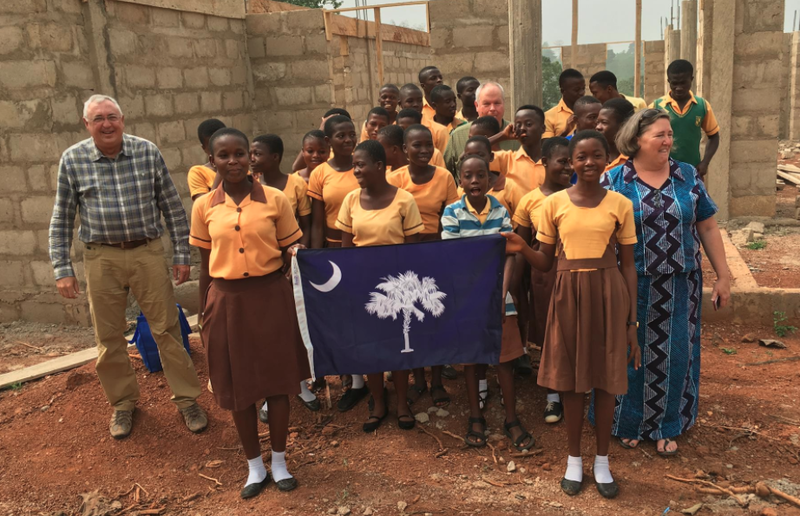 In December of 2015, Jim and I flew to Ghana (a 24-hour trip) to visit the village of Abesewa and check on the construction of the center and gather information about the area, the students and their specific needs for the center. Like most Americans, I knew very little about life in Ghana. My visit was a mix of emotions to see the living conditions of most people and yet seem to persevere. The Ghanaians are a generally friendly and happy people and we were welcomed wherever we went. The village of Abesewa is just about in the middle of Ghana and is home to about 2,000. 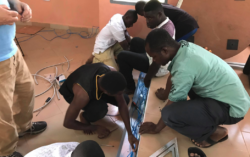 There was no running water, the toilets were outdoor latrines, but, there was electricity – which is key to a computer classroom. The school teaches children from Abesewa and the surrounding area from the first through the eighth grades. There are no school buses in this area, so children must walk to school, sometimes up to seven miles. In order to go to high school, the children must complete a comprehensive exam on several subject matters. One of the subjects is computers. 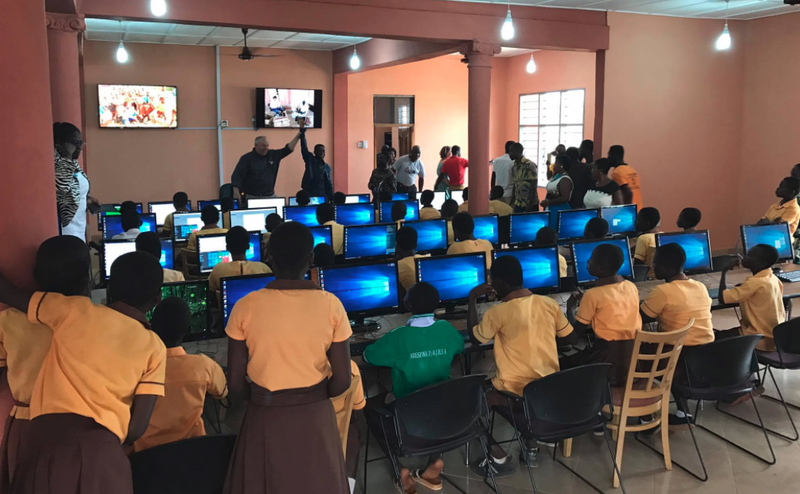 Virtually none of the schools in Ghana have computers in the school, so teachers can only teach computers in theory. Keyboarding is taught by the students drawing a picture of a keyboard on a piece of paper. The concept of using a mouse is taught by the student using a rock as a mouse. 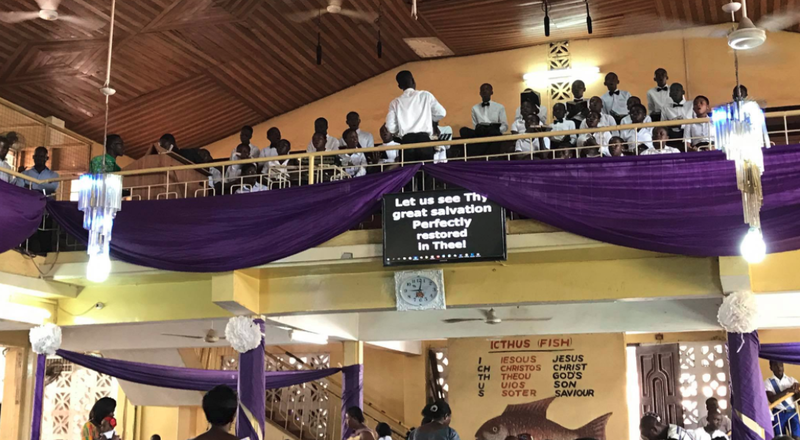 As you can imagine, many of the students cannot pass the computer section of the exam since they have never seen or touched a computer in their lives. Students who cannot pass the entrance exam to high school will see their education come to an end at the eighth grade. For most of these students, their prospect for life is dismal. They are destined to become low-skilled laborers or street peddlers who make just pennies a day. The struggles for food, water and shelter are a daily battle. The primary goal of our project in Ghana is to provide the schoolchildren of one of the poorest villages the opportunity to overcome the educational roadblock of the computer section of the high-school entrance exam. Our broader goal is to provide the community with a library and educational resources to enhance their knowledge of agriculture, health and general knowledge of the world so they all might rise above their current situation. 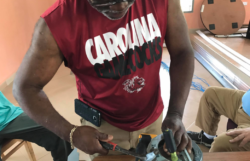 The churches of the Orangeburg District of the United Methodist Church bonded together to raise the needed funds to build the building, acquire the furniture, buy the computer equipment. 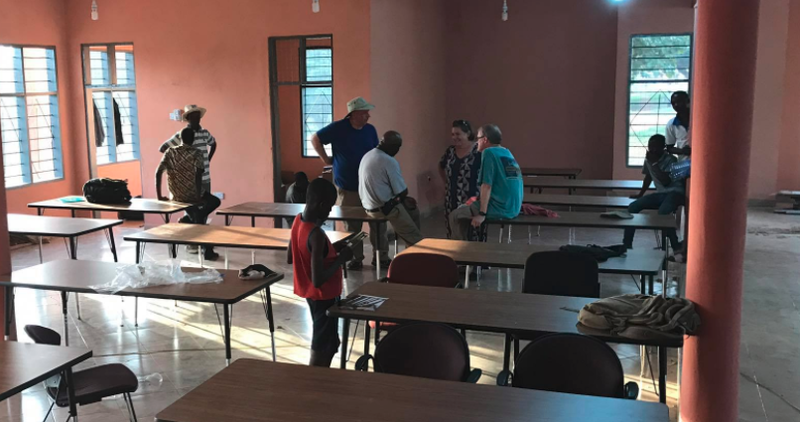 They raised a little over $100,000 and that was enough to build a beautiful 4500 square-foot building with a library, computer classroom, offices and real bathrooms (the only ones in the village). 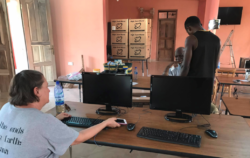 There was enough money left over to purchase 50 computers along with printers, network equipment and two large screens for the classroom. Donations of tables, chairs and library shelving poured in and would be enough to fill the offices, classroom and library. In March of this year, four of us (Rev. Jim Arant, Rev. Charlie Chamblee, Rev. Bobby Gordon and me) flew to Ghana to install the furniture and equipment. 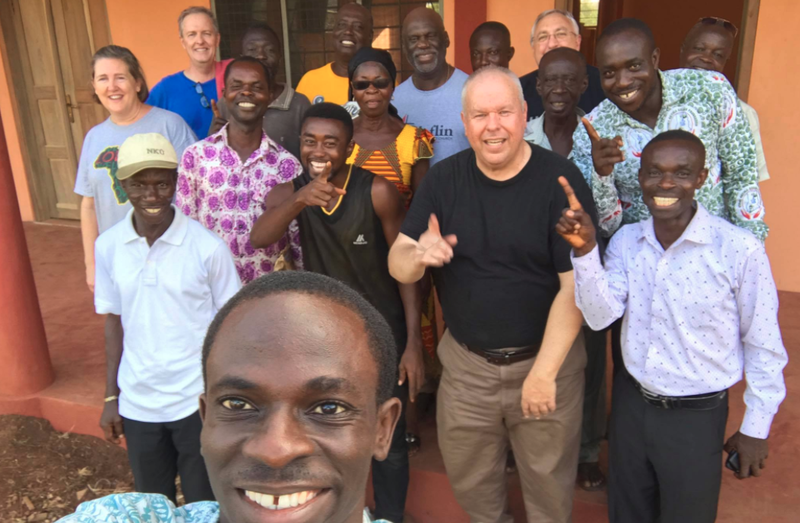 This amazing two-week trip was truly life changing – for the people of Abesewa and us. We stayed in the city of Sunyani at the Bishop’s guest house and commuted an hour every morning to Abesewa where we worked until dark. Workers continued to put the finishing touches on the building while we installed computer equipment and furniture. Every day during lunch and after school, we would see the faces of children at the windows excited to see their new technology center and library. It was truly a village effort to complete the center. 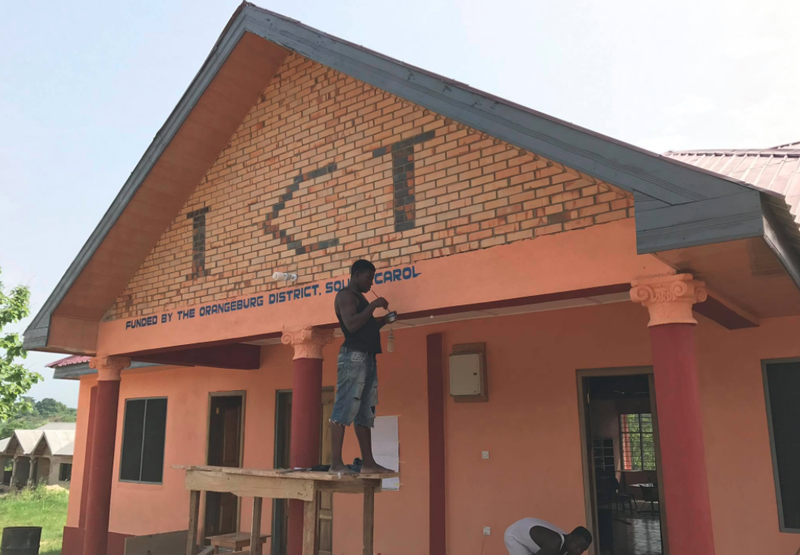 With the construction complete and the furniture and computers installed, there was a huge celebration where government dignitaries, clergy and local village chiefs attended with about 2,000 villagers and school children. 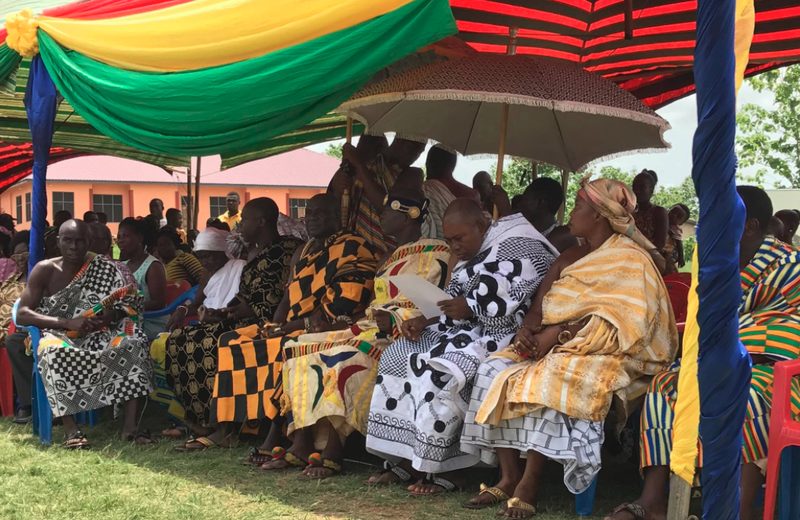 There were speeches, singing, skits and a huge dance party to celebrate this state-of-the-art facility that is the key to a new future for the villagers of Abesewa. It was a wonderful experience for all. Yesterday I encountered my first challenge on our trip. Our travel agent misspelled my name, so my ticket didn’t match my passport. I spent much of the day trying to get this worked out, but eventually had to re-book my flight for today. 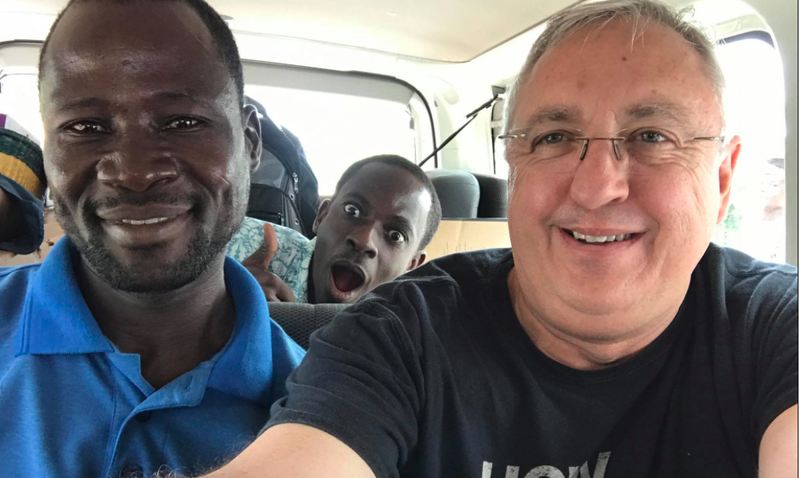 The rest of our team arrived in Ghana, safe and sound and are driving to Sunyani to the Bishop’s house. So, I’m at the Columbia, SC airport waiting for my flight to Reagan International in Washington, DC, where I will ride across town to Dulles Airport to catch my plane to Ghana at 5:40 this afternoon (South African Airlines, Flight 210, if you want to track me across the ocean). TSA twice in one day! I will arrive in Ghana at 8:00 AM tomorrow morning where I will meet our host, Mary Kay Jackson. We will fly to Kumasi, Ghana, then drive to Abesewa where we will meet up with our group tomorrow afternoon. I’ll post a few interesting facts about Ghana, today, as I try to ease the boredom of airports. To learn more about our mission, visit www.umcscinghana.org. I made it to Washington, DC and am about an hour away from boarding my flight to Ghana. Did you know that in Ghana, children must pass a comprehensive test to graduate from Junior High School to High School. If you can’t pass the test, your education stops. Part of that test is a section on computers. 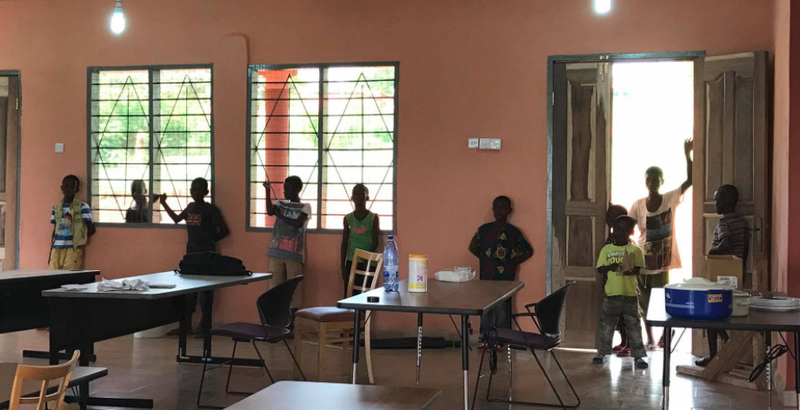 In the village of Abesewa, they teach computers without computers. Needless to say, the failure rate is quite high. When we are finished with our mission next week, we will remove this obstacle with a classroom of over 40 computers. My next post will be from Ghana! Time to board! 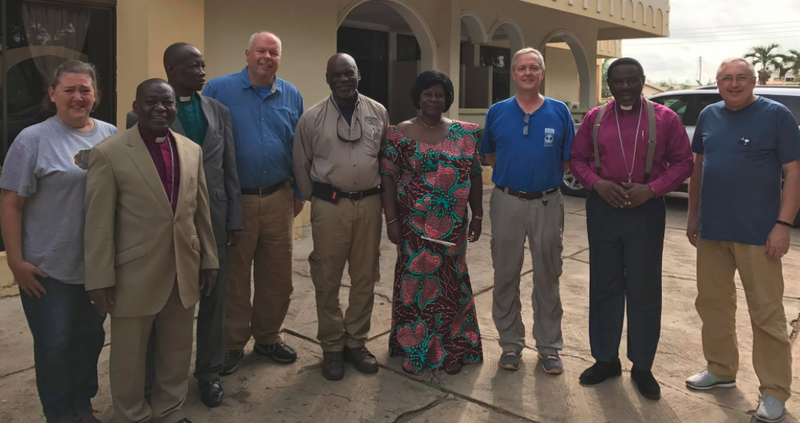 Today, in Ghana, Africa – We met the Bishop of the Methodist Church of Ghana, Most Rt. Rev Titus A. Pratt and his wife. Next, we stopped at the mobile phone store so Bobby and Danny could update their phones, Ghana style. After that, it was on to the Technology Center where we finalized the classroom arrangement and prepared the tables for computers. Danny and the electrician worked on the wiring for the classroom. Jim and Bobby worked with the helpers in preparing the tables. I went over the plans for the computers with the ITC staff and I teamed them on how to put connectors on Ethernet cables. Day Four in Ghana – We started our day with a traditional Ghanaian breakfast of oatmeal, butter bread, and fruit – pineapple, papaya, banana (incredible, sweet, tasty banana – unlike anything you will find at your grocer in the U.S.). After breakfast, a quick stop at the stationary store to pick up a case of paper. Then, it’s on to Abesewa to work on the technology center. In the morning, we worked on the conduits for the electrical and network wiring. 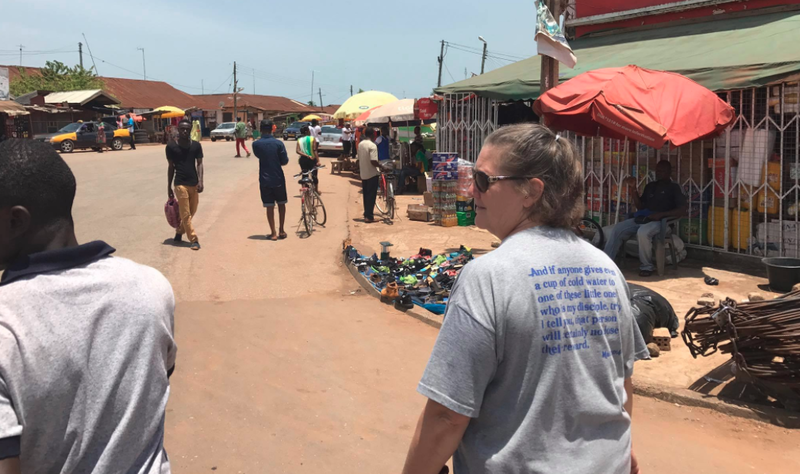 Around lunch, Mary Kay Jackson and I went shopping in the village of Bechem for a few needed items. This is a real challenge here, as you must go to several shops to find simple things, like screws, batteries and cell phone charging cables. No Walmart’s here! For lunch, we had a meal of deep-fried chicken (not KFC) and Joloof (spicy rice with bits of fish, chicken and whatever else they have to throw in the dish (it was good to me, I don’t want to know the details). After lunch, it was back to work. More electrical and network wiring. Daniel completed the wiring of the power converter and conditioner. This is a big deal since all of the computers will run off 110 power in a 220 country – WooHoo! 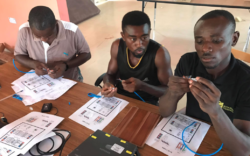 Day Five in Ghana – Once we arrived at the Technology Center, it was right to work. The children in the village came to help, so they went to work right along side of us. 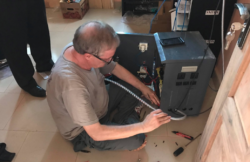 We ran about 1800 feet of network cable and we nearly have the electricity complete – through some amazing ingenuity and creative thinking from Danny, Bobby & Jim. Later in the day, we rewarded the children for helping with cookies and Ghana flags. They were very excited for this special treat. Between our tasks, we took some time to talk with the kids and get to know our Ghanaian co-workers (who can work circles around us). Mary Kay Jackson has been our saving grace in so many ways – from translating the local dialect, to running errands, to being our guide and host, and to help us think through issues when we are too hot and too tired to think. 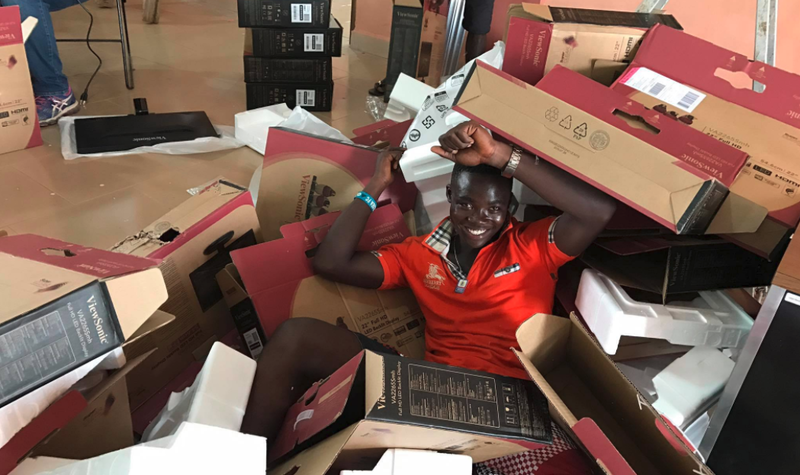 Thanks to Mary Kay, and all of our Ghanaian brothers! Tomorrow, after church, we will be installing the first of the computers. It’s been a long time coming, so we are all very excited to get to this point. Sunday Morning – Ma Chee (Good Morning)! Today we attended church at Wesley Methodist Cathedral Church where we heard Presiding Bishop Awotwi Pratt (the highest ranking Methodist official in Ghana) deliver a sermon on God breathing new life into dry bones. The service lasted three hours and was very moving. There was a lot of activity and song, so the time just flew by. The Children’s Choir sang The Glory of the Lord will be Revealed from Handel’s Messiah – it was truly incredible! 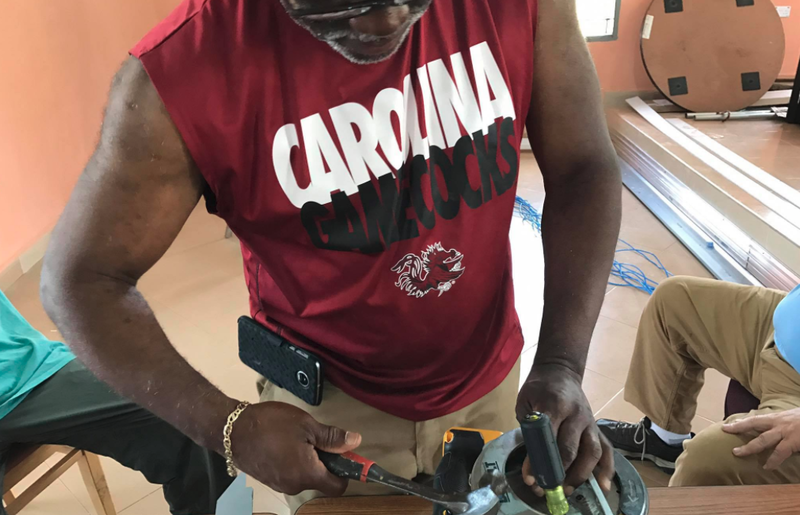 We are heading back to Abesewa to do a little more work on the Technology Center, carrying the grace and inspiration we received this morning with us. Thanks for all the amazing comments, but, remember, the glory is God’s and we are merely vessels. Nyame n shi rah woe (God Bless You)! 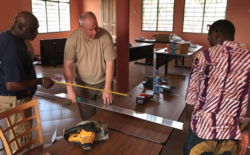 Day 6 in Ghana – We had an abbreviated day at the Technology Center, since it is Sunday. 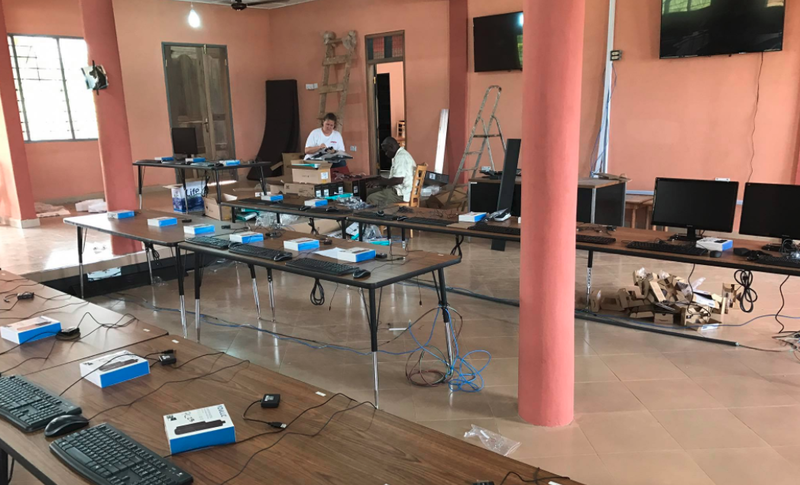 The network cabling has been completed and the electrical work (a difficult challenge) is just about ready to be delivered to the computers. We set up our first two student computers and mounted the teacher’s 55″ classroom displays! These little victories are very uplifting! Just three more days until the dedication! We had several visitors today. 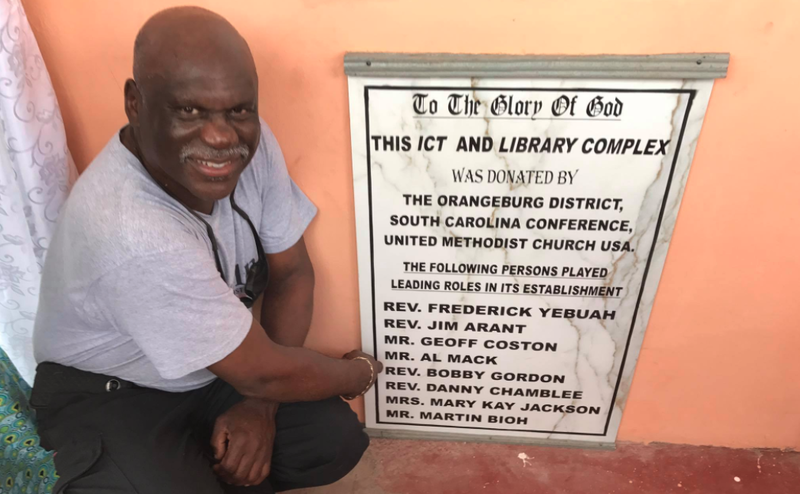 First, the man who conceived the idea of the Technology Center in the town where he grew up, Martin Bioh, stopped by and dropped off several computers donated by the former First Lady of Ghana, Lordina Mahama. Next, the Presiding Bishop stopped by on his way back to Accra, the Capital, to view our progress. Finally, the town elders of Abesewa came to the center to meet us. We all got together for a group photo. On the way back to Sunyani, we stopped at a roadside garden restaurant to have a pear-flavored soda and some grilled & peppered chicken gizzards – yum. Lots more work to do tomorrow! Da yie! 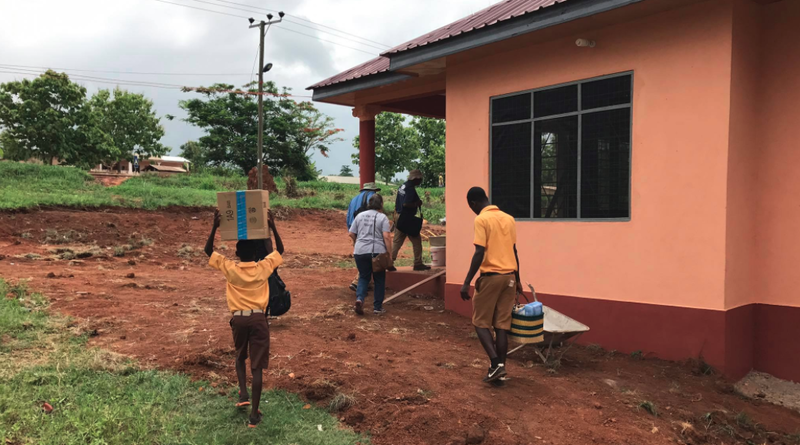 Day 7 in Ghana – what a difference a day makes. Thanks to some awesome Ghanaian help, we have all of the computers in the classroom set up, and the power complete to a lot of them! We are using a stick PC, which is a small PC plugged directly into the monitor. The computer uses an energy-saving Intel processor with 2 Gigabytes of RAM, 32 Gigabytes of internal storage, a 128 Gigabyte SD card, a 22″ LED monitor, keyboard, mouse & headphones. 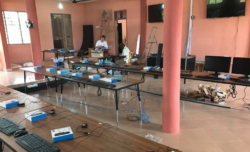 They are all networked together and to a Raspberry Pi server with a 1 Terabyte Solid-State Drive as well as a shared 1 Terabyte drive for Additional classroom storage. 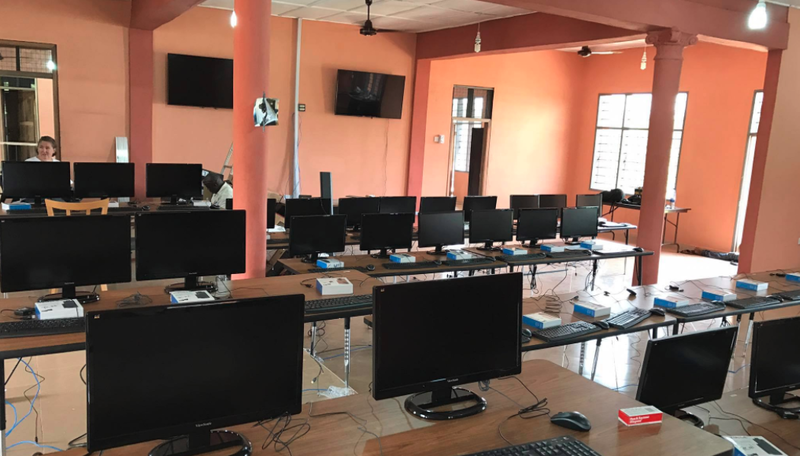 They are running Windows 10, Office and loads of educational software. Security is always a concern, whether you are in Ghana or the US. We have tied down all of equipment with security cables and padlocks. In addition, we have a night watchman who stays at the center overnight. There are still some finishing touches to be completed. 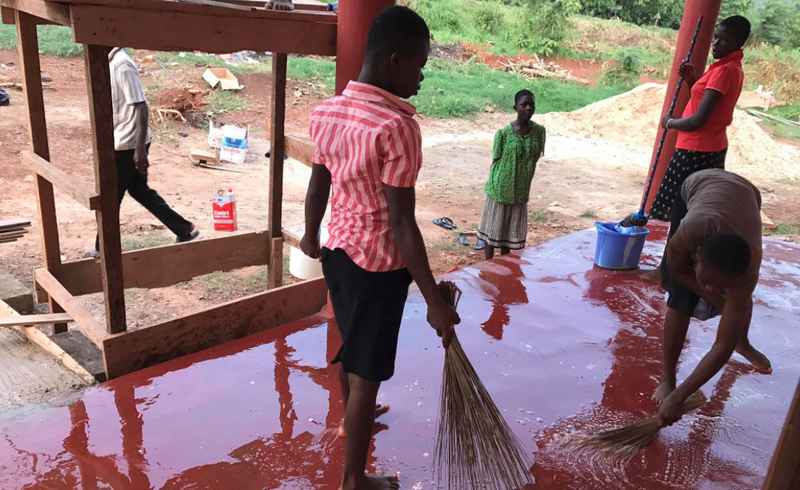 They were pouring concrete for the back steps today – this is very hard work in Ghana. They first collect large rocks from around the area and then mix concrete the concrete with water from a well on the ground. The mixed concrete is then carried to the forms for the steps in a huge bowl. The laborers are residents of Abesewa, so this is truly a village effort. We are very excited about the progress today and are looking forward to the dedication on Wednesday. Day 8 in Ghana – The dedication of the Information & Communication Technology Center (ICT) is set for tomorrow morning. The final touches were being applied today. Painters, carpenters, cleaners and others were hard at work to get the center ready. All of the computers are in and the electrical wiring is complete. The library space is complete and the shelves are ready to be filled with books. Tomorrow, the lives of those in the village of Abesewa and the surrounding area will be changed forever. It’s been an amazing and fulfilling journey to get to this point. Let the celebrations begin! 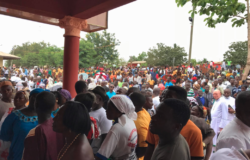 Day 9 in Ghana – DEDICATION DAY! – Words cannot describe the celebration we experienced today. 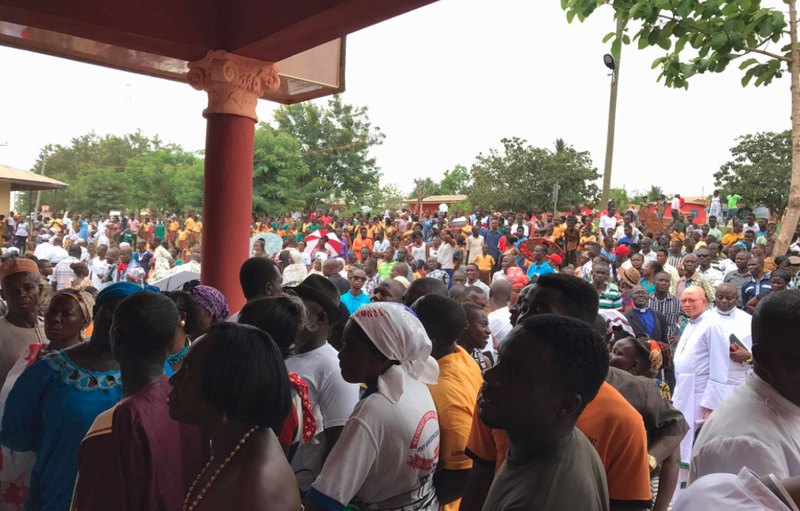 Most of the village came out to celebrate the dedication and opening of the ICT (Technology) center. There were chiefs from surrounding villages, representatives from departments of education, and political figures along with hundreds of villagers and schoolchildren. It was an amazing event we will never forget. The center was decorated with the colors of the flag of Ghana. There were tents, and music, songs and dramas by the schoolchildren, speeches by officials and many, many thanks to everyone who contributed to and participated in this project. It was a wonderful day! More to come later. Day 10 in Ghana – After the incredible day of celebration and dedication, today was a “clean up the loose ends” kind of day. 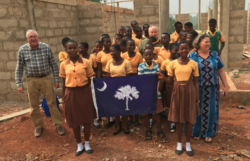 Jim Arant and Mary Kay Jackson went to a local Methodist meeting, while Bobby and I went back to Abesewa. Before we got on the road, we did a little shopping for blue paint (had to go to 5 paint stores to find blue) and a couple of soccer balls and a pump. Upon arriving in Abesewa, Bobby and I gave the soccer balls to the school Headmaster for the kids. Soccer is HUGE here, and the kids play continuously when not in school or doing chores. Bobby toured the village and handed out about 500 t-shirts to needy families. I worked with the IT staff to get the computers ready for classes and finished training. We said our goodbyes to the staff, leaving the Center in their capable hands.